You can change the name of a node, or mass-rename a bunch of nodes at once using find-and-replace. In the network editor, click the name of the node (next to the node body). Or, select the node and press F2. Houdini automatically updates any existing references to the node in the scene. You don’t have to worry about renaming a node breaking expressions. 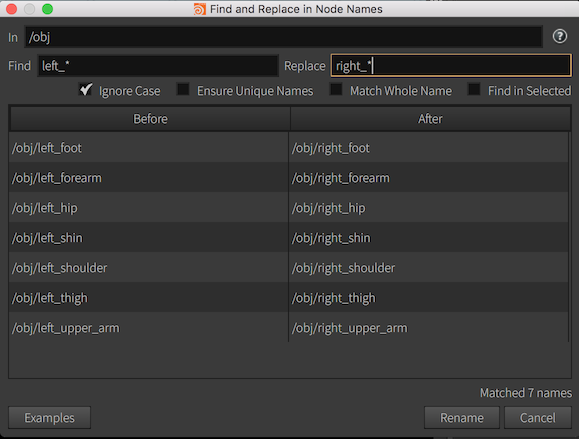 In the network editor, choose Edit ▸ Rename Nodes, or press Alt + W.
The "Find and Replace in Node Names" window will open. In the Find field, enter the text/pattern to look for in node names. (See patterns below for how to search and replace with glob patterns.) In the Replace field, enter the text/pattern to use to replace matches in node names. As you type in the fields, the preview table below the controls updates to show the renames that will happen if you click Rename or press Enter. If any rename would cause an error (for example, the "After" name is invalid or already used), it is highlighted in red in the table. If any of the rename operations in the table have an error, the Rename button will be disabled. When this option is off (the default), the window will not allow you to proceed if it detects one of the renamed nodes would conflict with an existing name. If you turn on Match Whole Name, Houdini will only consider a node if the Find pattern matches the name from beginning to end. For example, if Match whole name is on and Find is null, it will match a node named null but not a node named null2. If the Find string starts or ends with an asterisk *, Houdini acts like Match Whole Name is on. If you turn on Find in Selected, Houdini only looks at the currently selected nodes. The table below the controls shows a live preview of the renames that will happen if you click Rename or press Enter. You can enter a space-separated list of directory path patterns in the In path field to specify multiple networks to rename inside. If you want to match nodes to rename using criteria other than their names, first use the Find dialog to select the nodes you want to rename, then chooe Edit ▸ Rename Nodes and turn on Find in selected to make the rename only operate on those nodes. You can use glob patterns in the find and replace strings. The special characters are the same as standard Houdini patterns, with the addition of # to mean a sequence of digits. Matches any number of characters. Matches one or more digits. For example, 1, 0005, or 50607. Matchs any of the characters in the brackets. For example, [abc] matches a, b, or c.
Matches any of the characters in the given range. For example, [a-z] matches any lower-case letter from a to z (inclusive). The text matching a pattern (any group of special characters) in the Find text will be used to replace a corresponding pattern in the Replace text. If the Find text has more than one pattern, they will replace corresponding patterns in the Replace text by position (for example, the first * in the Find will replace the first * in the Replace, the second will replace the second, and so on). So, for example, the Find text *#_??? has three patterns: *, #, and ???. You can negate part of the find pattern by putting ^ in front of it. This is mostly useful for excluding names that start with or end with a certain string. For example, ^beta_* matches names that don’t start with beta_. If you include a negative match in the find pattern, the find pattern must match the entire name (as if Match Whole Name was on). Negation works differently in the rename dialog than in regular Houdini globs, because the regular behavior isn’t very useful for renaming. A hou.Node object representing the parent network in which to perform the renames. A string representing the text/pattern to find (see patterns above). A string representing the text/pattern to replace matches with (see patterns above). If True, the function only considers the currently selected nodes in the network to rename. If True, the find pattern must match the entire node name, not just a substring. If you supply a list in this argument, the function will append a ("oldname", "newname", "errormessage") tuple to the list for each rename that fails (for example, because the new name is invalid, or already used). If this is True, when a rename would conflict with an existing name, Houdini will add/increment a number at the end of the new name to make it unique. This means no rename will fail because a name is already in use, but the new names may not be exactly as you expected. There may still be failures if the "find" and "replace" patterns generate an invalid node name. Ignore uppercase/lowercase differences when comparing node names to the find pattern. If this is True, the function stop and return when a rename fails. By default, the function ignores failures and goes on trying to perform the rest of the renames. True if all renames completed without error, or False otherwise. The rename_nodes function puts the renames in an undo block. You can undo the renames that succeeded with hou.undos.performUndo().